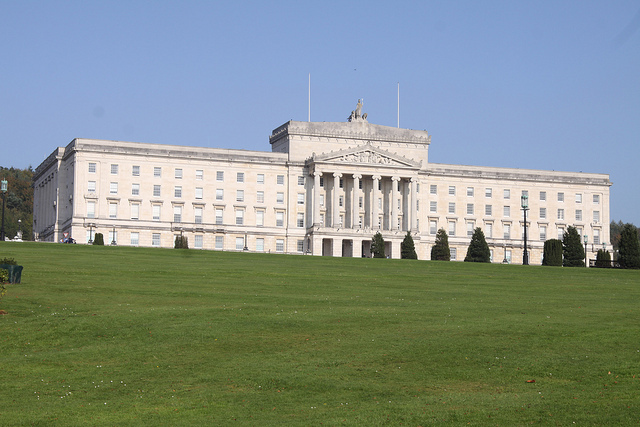 Cyclists’ concerns of increasing road danger and wasted public investment due to illegal parking were put to the Regional Development Committee at Stormont this week. The Committee has a statutory oversight and scrutiny role for matters relating to roads, infrastructure and transport in Northern Ireland. Despite presenting clear evidence of the problem, and conclusions on the causes, the briefing on the Reclaim Belfast’s Cycle Lanes report was given short shrift, and harsh treatment. Following criticism of not being an organisation (beware private individuals engaging in the political process) questions moved back to more constructive areas of road safety and parking warden deployment. Roads Service officials were next up in front of the Committee to respond to the issues raised by the report, and received a series of very tough questions. Yet Belfast commuter cyclists may be interested to note that neither cycling nor cycle lanes were specifically raised in questioning. The issue of the day was the concerns of Lisburn Road traders and the impact of priority patrolling there – so cycling got a little lost. “If we go to a road and there’s no traffic problems there, there’s no point in us wasting resources putting them there, if there’s no difficulty”. So Roads Service don’t consider cyclists’ problems to be traffic problems, and don’t care that the report highlights we are facing difficulty each night, all across Belfast. Belfast cyclists are not motorised traffic and therefore don’t count. Belfast commuter cyclists are fully aware, each day, of how valued they are on our roads – we see this in lack of infrastructure, dangerous junctions, and blocked cycle lanes. If Roads Service and the Department for Regional Development, and disappointingly the Committee which scrutinises their work, are not open to these concerns, where do we go? With this in mind, the date for Reclaim Belfast’s Cycle Lanes 2 will be the week of 5th November 2012 – bigger, better, and a louder voice? Let’s see what we can do.. Thank you Chairperson, and I’d like to thank the Committee for the invitation to present this briefing today. By way of explaining the origins of the survey, I’ll start with a little background on the NI Greenways blog. I started compiling it in April this year as a way of highlighting opportunities to open around 600 miles of disused former railways across the province, in the model of the Comber Greenway. My intention is to raise local awareness by mapping these potential traffic-free walking and cycling paths for commuting, leisure and tourism, and as a resource for Northern Ireland to combat our worsening obesity problems. As a commuter cyclist in Belfast for over 10 years, the social media connections I made through this blog brought me to discussion on the daily issues people face cycling to work on our roads. Alongside criticisms of lack of quality infrastructure, and general physical dangers, the major gripe was around cycle lanes in Belfast being blocked by parked vehicles. My own route has what’s termed as an advisory cycle lane running for 800m, yet every night during urban clearway operation it is blocked by anything from 10 to 30 vehicles. In June I raised a complaint with Roads Service, but received a less than encouraging response. In the 12 months to April, just 11 Penalty Charge Notices were issued on the affected section of my commuting route. To my experience, and as the survey would later bear out, this is the level of illegal parking per night. Roads Service informed me that records are not kept of deployment of patrols per road, leading to obvious questions about how they evaluate the level of illegal parking across the city, and therefore the effectiveness of patrol deployment. The idea for a city-wide survey came from Mark Tully, a lecturer in Public Health at Queen’s University, who unfortunately cannot be here today due to a prior commitment. Put simply, we could draw on the time and experience of commuter cyclists to record the number of illegally parked vehicles in cycle lanes, and bus lanes, during their morning and evening commutes. Safety was paramount and volunteers were encouraged to mentally note the figures, and jot them down at the end of their journey. Volunteers were also reminded not to challenge or single out people who were illegally parked, to avoid any unhelpful confrontation or aggravation. Some participants also took cycle camera video recordings both as evidence of the accuracy of figures, but also to allow our unique point of view to be experienced, and some footage is available to view through the blog. We set the survey for 5 working days on the week beginning 23rd July, and managed to get 9 volunteers. It should be noted that 4 of the participants were female, not a bad percentage for the survey, given that 2001 census figures put female cyclists at just 0.2% of all commuters in Belfast. At least one arterial route in each geographic quarter of the city was covered. After analysis by the team at Queens, the results for 69 qualifying journeys were released in the report which you all have a copy of. For a typical journey in Belfast, a cyclist will face 5 illegally parked vehicles blocking restricted lanes, or 4.5 for every kilometre of the city’s cycle and bus lanes. The worst performing route was the Springfield / Grosvenor Road corridor, with 26 vehicles illegally blocking cyclists on a typical journey. Evening journeys were worse than mornings – typically 6.2 per km or 7 per journey during evening rush hour against 2.9 per km or 4 per journey in the morning. It’s difficult to draw conclusions about this difference, but some of the factors at work may be more shopping trips to local stores on the way home, better driver understanding of bus lane rules, and driver confusion over the operation of the relatively new phenomenon of advisory cycle lanes on urban clearways. The survey puts clear evidence of this problem into the hands of frustrated commuters – it’s not just another grumble about our roads which can be easily dismissed. Why does any of this matter? The frustration of commuter cyclists is not due to any sense of entitlement to this road space but rather from the perception and experience of increased road danger which illegally parked vehicles create. Cyclists have to filter in and out of general traffic unnecessarily – the Committee will understand this is about to become a source of increased danger as we approach the winter months and dark journeys home. Each parked vehicle is a potential door opening accident risk. Road sides which should be clear have illegal visual obstacles increasing the risk of crossing pedestrians coming into conflict with other road users. As we’re the slowest road users, mixing with general traffic leads to pressure on cyclists and many dangerous overtakes by equally, and perhaps understandably, frustrated motorists. Recently released PSNI road casualty figures show a jump in cyclists killed or seriously injured in Northern Ireland, 49 in each of the last two years against a baseline measure of 28. Looking at the trends for all road casualties, road safety has significantly improved in Northern Ireland over the past 10 years, with casualties for drivers, passengers, pedestrians and motorcyclists all down. Cyclists are the only group to with an upward trend in casualties, a worrying and underreported development. Just last week one of the survey participants was involved in a road collision with a car crossing a cycle lane through stationary traffic in Belfast. If they had been driving a car, this would have been a minor prang with insurance details swapped – it landed the cyclist in A+E and wrote off their main form of transport – luckily and importantly, no lasting damage was done to the cyclist. We are among the most vulnerable road users, and taking steps to eliminate a fairly straightforward problem such as illegal parking can make a big difference to the experience and safety of cycling in Belfast. What should concern the Committee, and all road users in Belfast, is that cycle lanes which are blocked every day at rush hour represent wasted public investment. We have notional targets to increase cycling levels in Northern Ireland, yet when paint is put down to mark out a city cycle network, regardless of how fractured and inadequate it remains in reality, cyclists are unable to use it. It fails to provide the separation of transport modes it sets out to achieve, fails to improve safety for all road users – in fact does the exact opposite while this problem persists. And crucially fails to properly sell the benefits of an alternative, yet viable form of commuter transport in our small city. or 18p per head of population. Compare this against The Netherlands where €30 per head is spent. Maybe it’s an unfair comparison to make – on another day I’ll make a forceful argument about increasing our spending on cycling – but how can we start that debate when our 18p is going down the pan? Indeed the letter became a little surreal when Roads Service stated that cycle lanes mean “cyclists effectively have their own road space. This makes cycling safer, and at times of congestion, allows cyclists to make time savings”. This is quite an absurd statement given the report which prompted the response. There was no acceptance that illegal parking is a major problem for cyclists, or that Roads Service bears some responsibility for ineffective enforcement. What was encouraging from the response are the changes proposed under the new contract with NSL, which Committee members have heard about from Ciarán de Búrca and the Minister in the past few weeks. The new protocol and associated awareness campaign should go some way to tackling illegal parking. The new tow and clamp policy, while potentially seeming like another stick to beat Belfast motorists with, will probably sharpen minds in the short term. These and other measures are to be welcomed as evidence of proactive traffic management. But, there is still one major worry running through from my initial complaint, to the survey, to the official response, and the new NSL contract. That is resourcing, and deployment – Roads Service steer clear of this point in correspondence, yet it is at the heart of the problem. Where parking wardens do not patrol, illegal parking will take place. As a prime example, I took to the Cregagh Road during the survey week, along with an onboard video camera. My typical journey across that week had 9.5 illegally parked vehicles, except for Wednesday when there were just 3. The reason? Two NSL parking wardens patrolling the road. I doubt they needed to issue many tickets, but the mere presence of high visibility enforcement was enough to practically clear the road. So, new towing trucks to move illegally parked vehicles – great. How many trucks? How will they be deployed? Will the current priority system remain in place, with constant patrolling of the Lisburn Road, and sporadic to no coverage elsewhere? The committee heard from Lisburn Road Traders last week, and I’ll add this one point to their criticisms – having 27% of all Northern Ireland’s clearway related tickets, on just one Belfast Road, is actually a damning indictment of the spread of enforcement across our city, especially given that it’s an arterial route supported by both the railway and motorway network. Will there be more than the current 1 or 2 car-based warden teams, and 4 or 5 teams on foot, for a city of around 20 main road corridors? Will Road Service commit to providing a better level of service across the whole of the city, or will the status quo remain? Certainly since my original complaint in June, and 11 weeks since the survey report, my rush hour journey has not had a clear cycle lane on one evening – not one. To conclude, all available evidence shows that cycling levels are rapidly rising in Belfast. Roads Service’s own figures from Belfast cycle counter locations show a 152% increase in cycle usage from 2000 to 2010. The DRD Travel Survey for Belfast commuters showed an increase in people declaring a bicycle as their ‘usual’ form of transport from 1% 2000-2002 to 3% 2008-2010. We now number in the thousands during rush hour across the Belfast, and if good, safe infrastructure can be maintained and promoted, people will choose to make the switch to the bike. The volunteers, and other commuter cyclists who’ve supported us since the report, will monitor progress on this issue very closely. I appreciate the Committee’s time this morning.